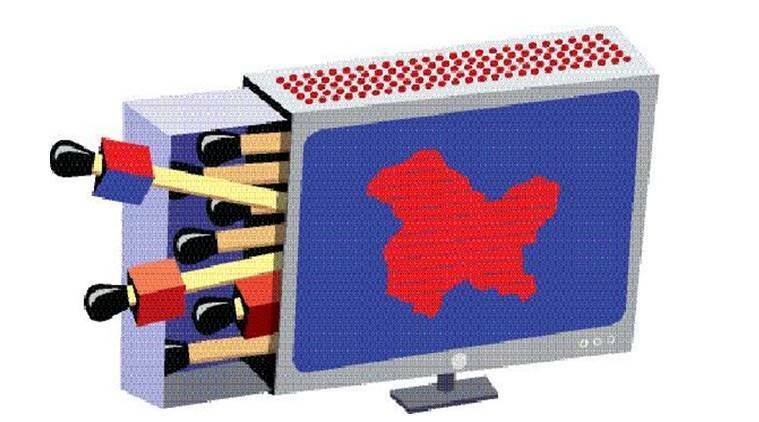 There is an urgent need for India to reclaim “national interest” from its national media. On the afternoon of July 13, my one-year-old child was finding it difficult to sleep because the adjacent curfewed street had been rattling with a sinister medley of azadi slogans and tear-gas explosions since daybreak. In a conflict zone, introduction to violence is a part of a child’s baptism. So here I was witnessing the exact moment when my child was getting marked as a Kashmiri — the tabula rasa of his mind impacted by history, much before he would be circumcised and officially marked as a Muslim. Kashmir had knocked at his conscience much before Islam. Three decades ago, I was in a similar moment with my father stroking me to sleep while mortar shells were pounding the hills in our backyard. Interestingly, the afternoon marked yet another familiar yet bloody rendezvous between the Valley’s past and present — it was 85th Martyr’s day. But the street unrest had a rather unusual trigger this time — the death of a young militant commander at Kokernag on July 8. Around the same time, I was alerted by an unknown caller that Zee News had been running a marathon discussion for past two days on the current crisis, and my photographs and videos were also being juxtaposed with the visuals, dead and alive, of young local militants from Kashmir, as some sort of a clash of role models. It perturbed me a lot — not only for the sheer insensitivity and shallowness with which this was being done but also for the security risk that it posed to my life. I was puzzled because with a Rs 50,000 monthly salary and a Rs 50 lakh housing loan I was certainly not the best example of a successful Kashmiri youngster. More so when the only measure of greatness here is the size of one’s funeral procession. Who would want to die for Rs 50,000 and die unattended, at that. My fears were proven right: Soon, I was told, there was a huge mob outside our colony, rallying against the remarks of the Zee News anchor asking the dead militants to be burnt along with garbage instead of being buried in India’s land; the studio and the street were competing with each other. Next day, I left for my office, incognito, wearing a kurta-pyjama and a farmer’s cap, hopping across check posts like a thief, knowing well that if a group of enraged youngsters recognised me, I might be in trouble, and rightly so, for falling on the wrong side of the Kashmiri vs Indian binary at such a critical juncture. Abusive comments on my Facebook wall had the same refrain. In the last few years, a section of the national media has been misrepresenting the idea of India in Kashmir, as part of a business strategy. It has also been projecting lies about Kashmir to rest of the country. It happened in 2008, in 2010, and in 2014. So there is nothing surprising about the tilt and the timing of this debate. Almost all the programmes on Kashmir right now are aimed to provoke people, the coverage is selective, and intention appears to be to compound the problems for the state government. The print media, though, has always maintained balance. What made the current round of commercial savagery by a few news channels even more tragic was that they continued to promote falsehoods, dividing people, creating hatred, completely disregarding the values of democracy and secularism, even when people were dying and the government was trying hard to calm down people’s passions. It did not stop even after appeals were made to de-escalate. This brazenness to market TRPs as national interest and do business over the dead bodies of young men was the worst aspect of these loud newsrooms. Kashmir or no Kashmir, the biggest challenge for India, this time, is how to reclaim the custody of “national interest” from its national media, and restore communication with its neighbours and people. I have no hesitation in saying that Zee News, Times Now, NewsX and Aaj Tak are at the vanguard of a movement that will take India from a dialogical civilisation to a dumb, illogical civilisation. In the Indian tradition, the state is supposed to communicate with its people through accommodation, not harangue, and through welfare, not violence. Ashoka put together a network of pillars and edicts to communicate with his people. During the Mughal rule, Diwan e Aam also symbolised direct communication between the state and its subjects. The firmans could only be issued by the sovereign, not by scribes and minstrels, as is the case today. In the Islamic tradition, too, truth, patience and perseverance are central to communicating. As a confluence of Indo-Islamic experience, Kashmir needs a mix of honesty, truth and directness. Communication that divides will only hurt India’s case further. When we are looking for the causes of the ongoing unrest, we must also look at how we have outsourced, or rather abdicated, communications to TV channels, which are only interested in provoking and alienating. The Indian state can’t afford to leave the Kashmir project to intellectual renegades, political turncoats, opportunists, intelligence agencies, and most importantly, to self-appointed vigilantes of the national interest. In Kashmir, people often confuse the outrageous editorial policy of the national media with the oppressive state policy. When Kashmiri representatives are bullied in TV debates, their aspirations ridiculed, their grievances shouted down, the symbols of Kashmiri pride insulted, or when non-issues are given precedence over the killing of the innocents, when military bravado is encouraged over civilian agony, when positive initiatives of the state government are overlooked, and truth is not shown at all, and most importantly, when cows are made to feel more important than the Kashmiri people, the frustration and anger will, expectedly, be directed against India. Every hour of prime time TV news aggression pushes Kashmir a mile westward from India. It may not be easy to intervene or even shut down these mirror-houses of hateful journalism because there are constitutional safeguards for freedom of speech. But the unity and integrity of the country is a far bigger imperative and we will have to restore the original, traditional and additional channels of communication between Delhi and Srinagar that can cut down the noise and bile, and make newsroom nationalism irrelevant. We may as well have to convince these media houses to tone down their jingoistic rhetoric and pay heed to the feedback from the ground. Ask teenagers in Srinagar and they will tell you how all these years India has been communicating to Kashmiris through rigged elections, dismissal of elected governments, through encounters and corruption. They will tell you how India has become synonymous with a military bunker or a police vehicle or a ranting panelist on prime time television. Is this the idea of India which can win Kashmiri hearts? Accepting what India and its symbols stand for in the eyes of a Kashmiri is the first step towards untangling this Gordian knot. Kashmiris are very sensitive people. But they are by nature sceptics as well. Any dialogue with Kashmiris will bear fruit only in an atmosphere of warmth and will have to be done on equal terms, not as ehsan. The prime minister, who has single-handedly transformed India’s global image, should take upon himself the task of transforming India’s image in Kashmir.